I've tried various methods for cutting the taper on my fingerboards. I've cut the taper with a bandsaw. I've cut the taper at other times with a handplane. But this method I've found is the easiest for me. I found the idea for this jig in an article in American Lutherie magazine about Charles Fox's building methods and jigs. Here's a photo. The jig slides in the miter slot. 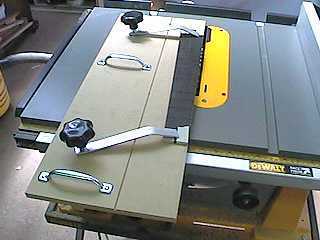 All you do is cut the right edge of the jig with one pass on the table saw. Then, to cut the fingerboard taper, you just line the taper line up with the right edge of the jig, clamp the fingerboard down, and slide the jig in the miter slot.